Karla grew up on a small farm in western Oregon as an only child of older parents. The nearby woods that fringed the fields her family leased for their wheat became her haven. 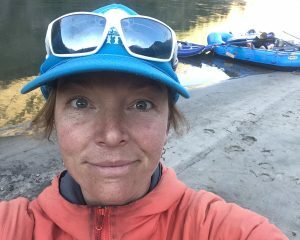 She began outdoor education as a high school assistant in Washington and Multnomah Counties Outdoor Schools for 6th graders (Portland area). Later, she fell in love with river-rafting in college at U of Oregon where she earned a B.S. in Recreation/Outdoor Education and an Elementary Education teaching certificate. She learned she could use the river as a classroom for nature studies and to promote active civic engagement. At 27 years old she was a member of a nine-person team that completed one of the first river running descents of Karnali River in western Nepal on a 55-day expedition, aka “American Himalayan Whitewater Expedition of 1981.” They had no film crew, no radios and of course no cell phones. Karla also worked as a naturalist at Aspen Center for Environmental Studies for 3 years where she created elementary level curriculum and teacher training program, taught adult courses, community education in Winter Ecology, and led snowshoe walks for the public. In 1986, she earned a master degree in Natural Resources from Utah State University. 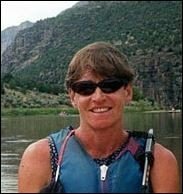 She had moved to Moab in 1980 to work for BLM as River Ranger on the Green River, and later, three years on Westwater. She started CFI in 1984 with co-founder Robin Wilson, who died of cancer 1991. Dave grew up “in the woods” of New England, with a strong attachment to the outdoors – hiking & skiing mountains, canoeing rivers & lakes, and climbing cliffs & peaks. He also had a predilection for environmental causes and activism. 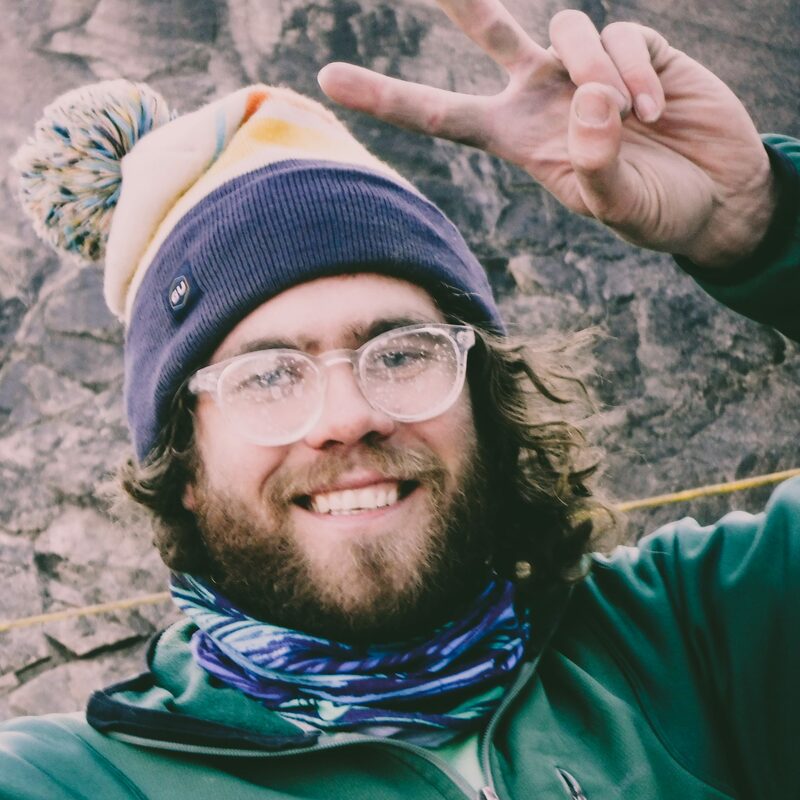 After college, he moved out west to climb & ski the “big” mountains. Soon after, he began a career in environmental activism, working with Greenpeace across the US and Canada. This eventually led to a few years of marine/ocean based work in such places as Antarctica, New Zealand, South America, and the Persian Gulf. 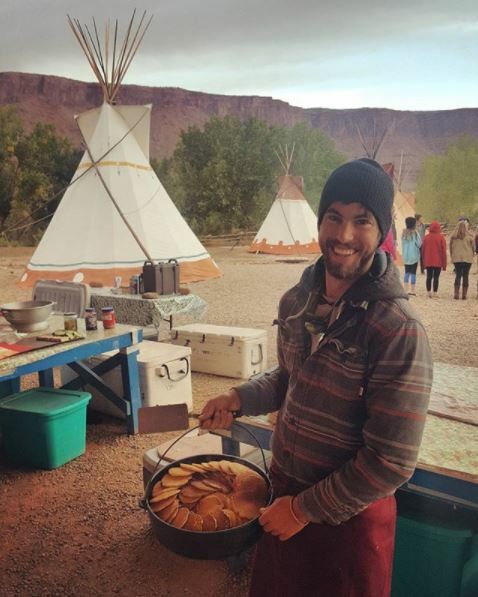 Upon returning back to the US he transitioned into field biology, living and working in the Grand Canyon and northern Arizona. Then it was back to sea, working aboard an eco-tour ship sailing from Newfoundland, down the eastern seaboard, through the Panama Canal, along the west coast of South America, and ultimately back to Tierra del Fuego and Antarctica. He eventually found his way to Moab in the early 90’s – drawn by the canyons and desert – and set down some roots. He’s lived here ever since, with occasional sojourns in the form of self-support long-distance bike touring in New Zealand, Baja, and along the Great Divide. He’s worked in the bicycle industry, with tour companies, in music & stage management, and graphic design. He’s also been self-employed as a luthier and woodworker. His background and experience in logistics and operations management brought him to CFI in 2013, where he looks forward to helping people learn about, and connect with, the beauty and wild nature of the Colorado Plateau. Resford is a Moab native who has returned to work for CFI. A lifelong resident of Utah he spent his time away from Moab attending the University of Utah. During his undergraduate career, he completed bachelor degrees in environmental studies and anthropology. He continued his academic career – focusing on the intersections between the natural world and society – by completing a master’s degree in environmental humanities. 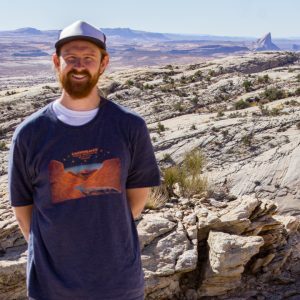 His thesis ‘Moab and the Monument: An Oral History Project on Local Perspectives of a Greater Canyonlands’ set out to better understand the beliefs within the community of Moab regarding the Greater Canyonlands Monument Proposal. Kori brings 15 years of experience in environmental education, curriculum design, and wilderness expeditions to CFI. She has developed, coordinated, and taught field based courses from Patagonia to the Yukon and Yangshuo, China to New Zealand. While earning her M.S. in Natural Resources and Society at the University of Idaho, Kori designed and lead a Professional Development workshop for High School Teachers to engage students in place-based learning about climate change. After Grad School, she worked as the Director of Expeditions and Risk Management for the Alzar School, an independent semester school in Idaho, where she developed a summer leadership program and mentored staff leading exceptional teens through Idaho and South America. Now she is happy living in the red rock desert of Moab, helping educators to inspire a deep connection to this place. When not at CFI, Kori is busy running, biking, climbing, boating, and skiing with Eric, her best adventure buddy and partner. Kate grew up around the DC Metro Area in Maryland. Her passion for the outdoors started early with building tipis in the backyard, “creek stomping” during cross country practice, and her first job in a backyard birding nature store. Her migration west began at the University of Wisconsin – Madison where she earned a B.S. in Rehabilitation Psychology. She believes connections with nature are important for mind, body and spirit, and is dedicated to providing opportunities for people of all demographics to grow through adventures in wild places. Since 2009 Kate has worked in high/low ropes courses, wilderness therapy, and experiential outdoor education. Kate started at CFI as a Program Intern in 2010, was a naturalist guide for several years, and now is embracing the desk life as Development Director. Outside of work, you can find her on the trail soaking up the sunshine of the high desert, or at her homestead growing food with her pups and partner, Mike. April grew up along the beautiful banks of the Spokane River and Coeur d’Alene Lake in Northern Idaho. Fifteen years ago she was introduced to the rich red soils of Moab, Utah. She found a passion not only for the landscape, but for the cultural history of this beautiful area. She moved to Moab three years ago and decided to make Moab her home. April completed an undergraduate degree in History with the University of Idaho in 2006 and later went on to secure a Master’s degree in Public Administration and Certification in Natural Resource Conflict Resolution with the University of Montana. When she is not on a trail or in the office, April is often found swing dancing or reading. As Registration Coordinator with CFI April now has the opportunity to share her passion with others, inviting them to make connections with the culture and landscape as well. April will be your first point of contact in facilitating your outdoor learning adventure. 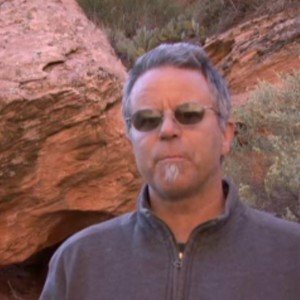 A native of South Africa, Alex has traveled extensively before finding himself on the Colorado Plateau. He holds a Master’s degree in Geology and Geophysics and has worked as a professional geologist throughout Alaska and Canada. 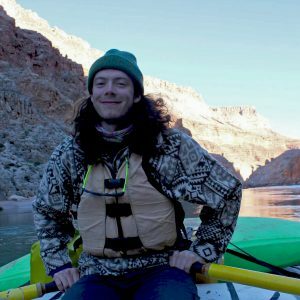 While trying to combine his passions of boating and geology, Alex found CFI and the desert Southwest. He can now be seen animatedly talking about rocks on the river, on his bike, or with a fly rod in his hand to any and all that will listen. Brennan Patrick Gillis has always felt drawn toward the outdoors. After studying creative writing and geosciences at Franklin and Marshal College in Lancaster, PA, he followed the call to Maine’s 100 mile wilderness. He worked for the Appalachian Mountain Club as the assistant manager of Gorman Chairback Wilderness Lodge in central Maine. Afterward, he moved to Cape Cod to teach for the YMCA, then trekked cross country to teach for Slide Ranch, an educational farm north of San Francisco. He moved to Moab in March 2018 to start as an apprentice for CFI. Sara grew up camping, hiking, and exploring in North Jersey. Her love for art brought her to Scranton, Pennsylvania where she received a bachelor’s degree in art therapy from Marywood University. After spending a semester abroad living in Florence, Italy and finishing her undergrad she realized that traveling and experiencing life is something that she wanted to do! She spent two years serving in AmeriCorps in South Florida and Oregon getting a feel for the different cultures and landscapes our country has to offer. 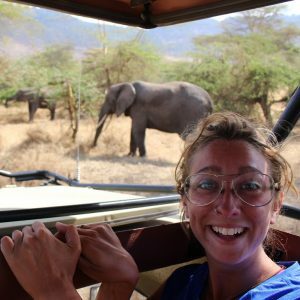 After volunteering for two years, she made her way to East Africa for a 75-day backpacking trip, where she summited Mount Kilimanjaro! Realizing she loves the outdoors and wants to guide like-minded people like her through the wilderness has led her here with us! Evan grew up in a small town in Connecticut’s rural suburbia, catching frogs, riding bikes, and hiking surrounding state’s highpoints with his family. He went to the University of Connecticut, worked with the outdoors program as a trip leader, and graduated with an Environmental Science degree. After school, he and his buddies biked across America, coast to coast. Since then he’s worked on a trail crew in Colorado, as a bike mechanic in Connecticut, in a conservation corps in Idaho, and on a small farm in California. Having worked on and with the land, Evan is excited to start working with people to foster a deep appreciation for this wonderful area. Originally from the granite-clad foothills of Northern California, Ryann was raised on summer days at the river and family camping trips in the Sierra Nevada. She earned a B.A. in Environmental Humanities from Whitman College in Walla Walla, Washington where she wrote her senior thesis on the Green River Watershed and her family history held within its silty flow. With a minor in anthropology, Ryann is passionate about people and place, stories and legacies. 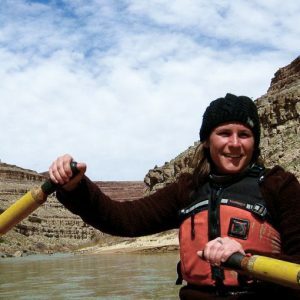 She first came to Southeastern Utah in 2012 via canoe and returned in 2013 as an AmeriCorps VISTA for Epicenter, a non-profit in Green River. 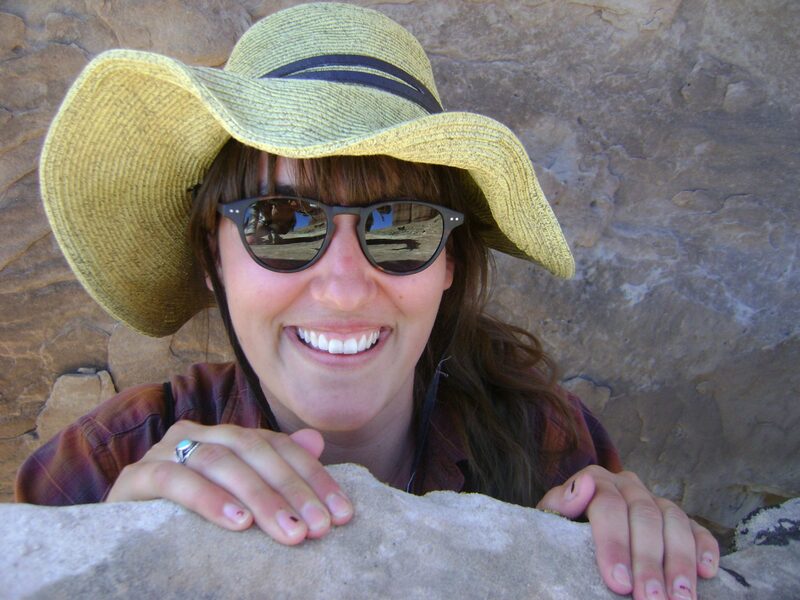 She believes preservation of land is inextricably tied to the preservation of its stories and is thrilled for the opportunity to live, work, teach, and learn on the Colorado Plateau with Canyonlands Field Institute. Nicky was born and raised in Salt Lake City, Utah where she lived until she moved to Flagstaff, Arizona to attend Northern Arizona University. 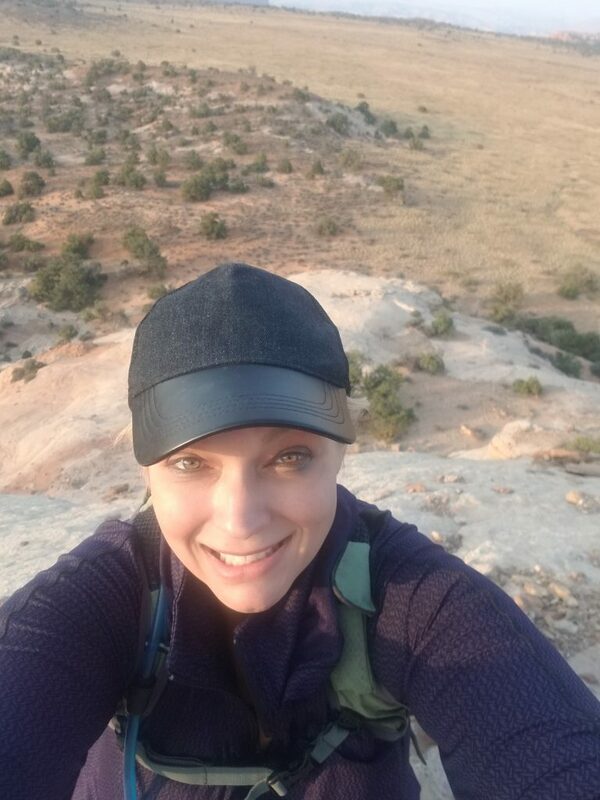 After graduating with a degree in Parks and Recreation Management with an emphasis in Outdoor Leadership she moved to Moab, Utah. Following her passion for running rivers and sharing her love for the outdoors with others, she found a good match in Canyonlands Field Institute. Between trips and various other jobs around the country and around the world she often made her way back to the red rock deserts of her native Utah and eventually put down roots here. In addition to running rivers she enjoys hiking, biking, gardening, yoga, and spending time with her partner, hound dog, chickens, ducks, and bees. 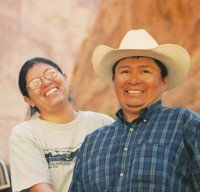 Eric and Charlene, both Navajo, have been guest guiding on CFI trips for years. Eric has always been attracted to the outdoors, ever since he was a teenager. And he has been working for CFI for much of that time, doing river trips and wilderness trips with pack stock provided by Rainbow Bridge Outfitters, the company he and Charlene own. Charlene grew up in Mexican Hat, Utah and when she is not out in the wilderness is a librarian at Monument Valley High School. A native of Zimbabwe, Tamsin has lived in the Four Corners states of the US since 1977. 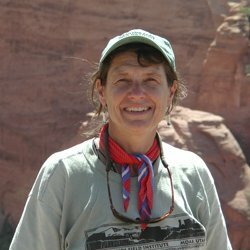 She holds Bachelor, Master and PhD degrees in geology, and has been teaching college courses in geology on the Colorado Plateau since 1993. She has served as a naturalist guide on river and land-based trips since 1994 and joined Plateau Restoration as a Board Member in 1996. 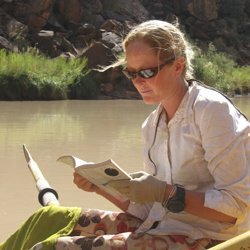 Tamsin is currently Adjunct Faculty at Utah State University in the Department of Environment and Society and Department of Forest, Range and Wildlife Sciences. Shawn has lived a full and varied life. For twenty years of his adult life, he worked in the construction industry in varying capacities from day laborer to vice president of design and construction, overseeing the construction of hotels throughout North America and the Caribbean. 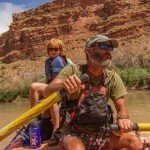 Upon the birth of his only child, Alta, Shawn took what was once an avocational activity, hardshell kayaking, and turned it into the vocation of boatman. Shawn now has twenty-five years or so on the river, in locations throughout the Pacific Northwest, Interior West, and the Southeastern United States. Shawn’s academic pursuits include undergraduate studies in Philosophy and graduate studies in Social Innovation and Sustainability. When not reviewing the philosophical works of Martin Heidegger or Zen philosopher Dogen, Shawn is either making plans for, or enjoying, his next river trip with his daughter.